his death. Kayhan Press, 1959. Iranians are great storytellers. As an American storyteller trying to stay focused on collecting anecdotes about the Allied involvement in Iran during the World War II, the other stories about this ancient land were a fascinating temptation. When I would ask Iranians about what contacts their country had with Americans before 1940, two names always came up: Morgan Shuster, an advisor to the palace in the 1910's, and Howard Baskerville, a missionary killed in Tabriz in 1909. Based on the stories both older and younger Iranians told me about "the American missionary" -- most couldn't remember his name -- this guy was going to be much more interesting. First, because as with most stories coming out of Iran, there is an element of conspiracy. The American had been shot by a sniper - but which side was the sniper on? Was he a "Royalist" supporting the despot Shah in Tehran who had abolished the Iranian constitution or was this sniper on the side of Sattar Khan and the "Constitutionalists" who were trying to gain advantage through intervention of European powers by creating a martyr? The second aspect to this Baskerville character was the legend which had grown up around the events of his death in 1909 and now spanned several generations in Iran. Over tea at a Washington, DC cafe on DuPont Circle, Iran's former ambassador to the United Nations Mohammad Javad Mahallati, told me of several schools in Tabriz and other cites which had been named after Baskerville. Long before the "hostage crisis" or the CIA escapades, Ambassador Mahallati said Iranians remembered this American in much the same way Americans honor Lafayette, Von Steuben, Kostushko and the other foreign military officers who helped win our independence. As a scholar, Professor Thomas M. Ricks, Director of the Office of International Studies at Villanova University, has collected a considerable amount of material for his forthcoming book about Baskerville. Professor Ricks served as a Peace Corps volunteer in Iran during the 1960's, but it was the story of his subsequent visits to Baskerville's grave in Tabriz during the 1980's and 90's that caught my interest. At the height of the anti-American sentiment in Iran during the 1980's, Prof. Ricks commented that whenever he visited Tabriz and went - unannounced - to the place where Baskerville was buried, the tomb was always covered with yellow roses. Given the political climate, no one claimed any knowledge of who had placed the flowers on any particular day, but there was general agreement that the tomb always had fresh flowers on it. Armed with the knowledge that Baskerville was serving with the Presbyterian mission in Tabriz, I located the archives of the Presbyterian Church in the U.S. and found every researchers dream: two enthusiastic and knowledgeable librarians, Susan Sullivan and Margery Sly. With their help, the files on Howard Conklin Baskerville were opened to me. Even after thirty years, I still get a thrill out of untying the string of a musty file folder and holding documents in my hands that were created by people who made history. It may be argued that curiosity is both a blessing and a curse to researchers on a deadline. In this case, after I had identified the basic documents which included Baskerville's hand-written application to the Board of World Wide Missions in which he explained that he would soon graduate from Princeton University and wished to gain experience in foreign language and culture before entering the seminary to study for the ministry, and the various letters and telegrams which were exchanged as he requested and was turned down for a position in China and then accepted a "short-term teaching" position in Persia. I continued looking through the files, partly out of simple curiosity and partly by way of gathering background on what kind of people became missionaries and what problems they faced. On a badly blurred set of 16 typewritten pages that began with the words, "You have heard long before this letter reaches you that your dear boy has laid down his life," the story of this young American teacher's life and death was told with such tenderness and emotion that by the time I reached the last page and saw the writers' name, the first thing I did was rush into the librarians office and ask her who Annie R. Wilson was. She recognized the family name of Wilson as one that had been prominent in the Presbyterian church for generations. Back in the files we were able to determine that Annie Rhea Wilson was the wife of the headmaster of the Presbyterian Memorial School in Tabriz. 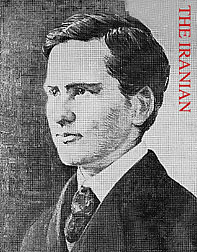 The letter, which was addressed to Baskerville's parents back in Minnesota, had been written over a ten-day period and was a sort of diary of the siege of Tabriz complete with descriptions of all the players from the American diplomat who warned the young American not to become involved in the internal politics of his host country, to the leaders of the Nationalist movement who welcomed the energetic foreigner and his band of student soldiers. Convinced that this was a documentary in its own right and Mrs. Wilson's letter was the script which should be left alone and used exactly as she wrote it , I turned to Prof. Ricks for a scholarly blessing as to the chronology of events, which he gave. Next, in keeping with a formula/ethic I had learned many years ago as a young journalist , I sought another source for confirmation of the material. Since the story took place in Iran, it seemed reasonable that the source had to be Iranian. Mohammad Batmanglij, the guiding spirit of Mage Publishers had been my sounding board for nearly a year on the original documentary about Iran and World War II and I had come to respect his critical comments because they were always followed with a scholars direction as to where I could find the information -- often lent from his own library -- that would put me back on track. I read him the parts of Annie Wilson's pertaining to the 1909 uprising in Tabriz, complete with the conspiracy theories, the siege by Royalist troops dispatched from Tehran, and the eventual victory of the Nationalists led by Sattar Khan. Batmanglij added his academic blessing, but as a publisher wondered if I would find an audience. Using the Annie Wilson letter as our screenplay, we have prepared a pilot production - starring an original Oliver typewriter of the same type as was probably used at the mission school in Tabriz. Because a documentary by its nature is both guided and limited by the actual historical documents available, we needed to fill in some gaps for the audience. Mr. Harold Jossif, a retired American diplomat who served as the Consul in Tabriz at the time of the 50th a anniversary of Baskervilles's death, narrates a brief summary of the background events, supported by excerpts from British and American newspaper accounts of the day. Howard Baskerville described in his own words the decision to join his students in the Nationalist movement as a matter of conscience. In telling his story, albeit from only the American perspective, I hope to encourage Iranian film makers to create a companion piece that will place this story in the context of your history. April 19, 1999 will mark the 90th anniversary of Baskerville's death. Perhaps we can honor this American idealist and his Iranian comrades by telling their story to a new generation. TEHERAN, APRIL 19. Alarming news comes from Tabriz. The local Nationalist Assembly is believed to intend organizing an attack upon foreigners if the Powers do not immediately intervene to save the situation. The famished mobs are restrained from rioting with the greatest difficulty. The revolutionaries under arms have supplies and will never surrender, but the provisions in the town are almost exhausted and the inhabitants find themselves between starvation on the one hand and the Shah's ruthless tribesmen on the other. In their frenzied condition they see no escape but by sacrificing Europeans and bringing Russian troops on the scene. Unless the representations which are expected to be made to the Shah by the British and Russian Legations tomorrow are productive of important results, it would appear as if a tragedy were inevitable in Tabriz within the next few days. TheNationalist forces in Tabriz made a determined sortie this morning, but with little result. An American missionary, Mr. Baskerville, who joined Sattar Khan a fortnight ago, was killed during the fighting. In consequence of the gravity of last night's news from Tabriz, evolutionary forces, as well as the Nationalist, designed a dastardly attack upon the Europeans in the town, the British and Russian Legations dispatched telegram to the respective Counsuls containing mesages for Sattar Khan and the revolutionary leaders to the effect that the outrages in contemplation "would exclude all concerned from any amnesty and ensure the most vigorous punishment of those responsible." ST.PETERSBURG, APRIL 6 - According to a telegram to the "Russ" from Teheran, it is persistently reported there that General von der Goltz of the German Army, has been entrusted by the Shah with the task of repressing the existing anarchy, and will shortly arrive to take over the command of the troops. THE LAST SORTIE PITIFUL SCENES IN TABRIZ MR.BASKERVILLE'S END STORY OF THE "REGIMENTOF SALVATION"
TABRIZ, Wednesday - All yesterday rumours were flying about the city that the Consulates were in serious danger of being attacked. I have authentic information that there is very good ground for these reports of an onslaught. They probably come from the famishing crowd, directed by the more sinister and well-armed element anxious and ready to take desperate courses. The British Consular Guard of six Indian sowars is quite inadequate for such an emergency. The Russian Consulate possesses fifty Cossacks with a Maxim gun. The French and American Consulate have no guards. Germany possesses only a Consular Agent appointed a few weeks ago, who signalised the occasion of his appointment by offering to the Anjuman, presumably on instructions from Teheran, to act as intermediary between them and the Shah, an offer which the Anjuman refused. I must now chronicle the gallant death of Mr. Baskerville, an American, lately master of the mission school. Some retrospect is necessary. On March 31st, by a curious coincidence, he left the fence of neutrality and decided to throw in his lot with the starving town, thereby sacrificing his appointment in the American school. It may now be admitted, without detriment to the town's situation, that a pitiable and profound demoralization has succeded the former courage and confidence, and that the Anjuman is weak and utterly powerless. The riflemen have never been organized and are now throughly disheartened, while disipline is reduced to the vanishingng point. The military power is supreme in the town, but unable to make any headway against the enemy, neither side being capable or willing to attack the Royalists, who are wisely content with the powerful weapon of starvation. We reached the rendezvous at eleven, and had to wait for the men. We only began to move at 4:30 a.m. Baskerville led 150 men to the right. By the time he arrived within range of the enemy, the number had dwindled to nine. With these he gallantly began the attack at 5:30, but was shot by a bullet through the heart when leading on. He died almost immediately.